There are times where I write a piece and think, “Hmmm, maybe I should have kept with that Sports Information and Communication major I had early on in college.” This HLOG piece is one of those times. I hope you all enjoy it. I am a glutton for punishment. Last year, the partner-in-crime and I thought it would be a great idea to venture out to UMass Amherst to see the Boston University men’s hockey team face off against the Minutemen. We wore our BU jerseys and all, and I was nearly jumped on my way to the ladies room. Well, this year, the partner-in-crime and I have decided to join a few colleagues of mine at tonight’s BU – BC matchup at Conte Forum, one of the few Hockey East arenas that I haven’t been to at this point. Heaven help us. They wear mustard colored cheap t-shirts with burgundy writing, either given out or sold by their bookstore. Maybe 2% of them own hockey jerseys. And if the hockey team is playing at the same time as their football or basketball team, they magically dissapear. 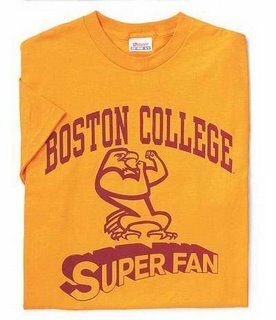 Ladies and gentlemen, I present to you the Boston College Superfans. Updated below with comment from Comcast Sports Net. CN8 will be shuttering it’s New England operations. This includes closing the studios right across from the College of Fine Arts building on the BU campus. According to Scott, CN8’s operations will cease in “early Janaury 2009,” leaving five of those six games without a TV home. Scott does say, however, that Comcast Sports Net may pick up the sports programming. However, their primary responsibility is to the Celtics, so I worry that college hockey might get lost in the shuffle. It remains to be seen what BU or UVM will do in the wake of this announcement. Big kudos to Scott for getting this news. UPDATE: According to the comment below, Comcast Sports Net will pick up several games on CN8’s college hockey schedule. Thanks to Tim from Comcast Sports Net for responding right away, and for Comcast for taking care of us college hockey fans.